Zimbabwean startup Dr CADx is hoping to raise funding to help further develop its innovative diagnostics solution after being named the winner of the local round of the Seedstars World competition. Disrupt Africa reported last month Dr CADx was named the winner of the Seedstars World event in Harare, Zimbabwe, with the startup now proceeding to the global final in Switzerland next April to pitch for up to US$1 million in funding. The startup is developing a computer-aided diagnostic system to help doctors diagnose medical images more accurately, and to provide pervasive radiology diagnostics in regions which currently do not have radiologists. Dr CADx was launched in August of this year by co-founders Gift Gana and Tatenda Madzorera. Gana had seen some promising results in adapting the image recognition technology from his bird species recognition app to interpreting medical images. The company’s diagnostic system uses a deep neural network, which a software that simulates how the human brain works in seeing and perceiving images and the patterns and features contained therein. “The process of training Dr CADx involves supplying it with a large set of medical images that have been classified by expert radiologists. The system analyses the images and automatically learns the features in the images that are characteristic of each particular disease,” Gana told Disrupt Africa. 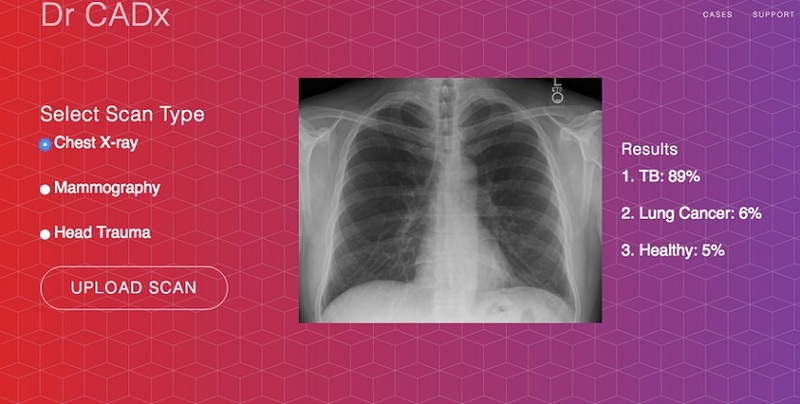 The solution is able to diagnose most diseases if it is supplied with the sufficient training data, though Gana said the startup’s initial focus is on lung diseases such as tuberculosis, pneumonia and lung cancer, as well as head injuries and breast cancer. Dr CADx is intended for use by medical professionals, who will use it on computers and tablets that doctors already use to view medical images. “So say you are having chest pains and you go see your doctor. He will order an X-ray to be taken and the digital image transferred from the X-ray machine to the doctor’s PC,” Gana said. It sounds simple, but Dr CADx is solving a serious problem. There is a serious scarcity of radiologists, especially in developing countries. In Dr CADx’s home country of Zimbabwe there is one radiologist to every 940,000 people. “None of these work in the public hospitals that serve the majority of the population, and this scenario is the same across many African countries. Some don’t have a single radiologist,” Gana said. Automating the diagnosis process using data and the cloud will improve these outcomes and increase access to expert healthcare. Dr CADx, however, has been heavily bootstrapped thus far and needs to raise money in order to continue development. “We are planning to start the trials phase in the second half of 2017 and then launch at the end of 2018,” Gana said. Such early positive signs make the team confident of eventual success, and Gana will go to Switzerland in April hopeful of raising the money needed. In the meantime, Dr CADx is currently talking to radiologists and the Ministry of Health in Zimbabwe to form partnerships, through which the partners will provide the necessary data and the startup will develop the algorithms. “These will eventually be also our testing partners when we reach the trials phase, and eventually be our first customers. We plan to extend those partnerships in the coming year to a South Africa and Europe,” Gana said. “Our revenue model will be based on delivering as Software-as-a-Service (SaaS) and billing hospitals and medical imaging centers per scan. Our projected pricing is US$1 per scan.